Episode 19 starts with Seul-Bi passed out and Woo-Hyun finds Jae-Suk and stops him and from touching Seul-Bi and then punches him. 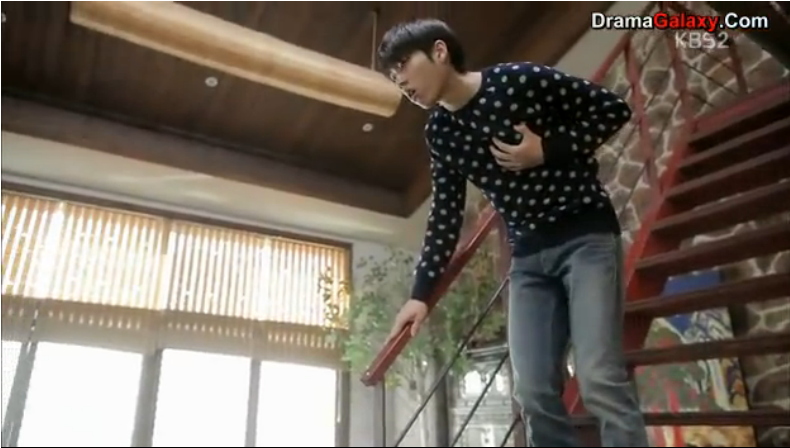 Woo-Hyun tries to take Seul-Bi in and Sung-Yeol is sick and barely opens the door for them. They take Sung-Yeol to the hospital and he has flashbacks to the time he had fun with Woo-hyun and Seul-Bi. He wakes up and Mrs. Ahn comes running in concerned about him and he notices she is wearing sandals even though it is cold outside. Woo-Hyun makes Mrs. Ahn wear his shoes because it is cold outside and tells her he is glad that she is a good person. Sung-Yeol goes home and his dad is sad for him too. The next day Sung-Yeol goes to his dad’s room and finds papers for a divorce. Seul-Bi finds him looking at it and encourages him that they can help stop them from getting a divorce. At school Woo-Hyun stops Jae-Suk and asks if he wants Seul-Bi to disappear and he says because everything is her fault and Woo-Hyun replies that Seul-Bi is concerned about him and without her he will be alone for the rest of of his life. Woo-Hyun finds Sung-Yeol and Seul-Bi and they are acting nicer to each other and he makes Sung-Yeol wear the yellow bracelet. Sung-Yeol tells him about the divorce and he asks him to talk to Mrs. Ahn. Sung-Yeol runs into Mrs. Ahn and he tells her to call his dad first because he isn’t good at returning calls and apologizing. In gym class they get a group of students together and they want to come up with an idea to Young-Eun’s sister to help pay for the medical help that she needs. Da-Yeol goes to Jae-Suk and ties the yellow ribbon on his wrist and tells him he should have been nice and tells him to fit in. Seul-Bi then talks to him that its okay to be different and to be with everyone so he doesn’t feel different and then high fives him. At the restaurant they are having a fundraiser for Young-Eun’s sister. Jae-Suk meets some other high schooler students and they want to fight him. Jae-Suk starts fighting and Tae-Ho and Byeong-Wook show up and help him fight them. Tae-Ho, Byeong-Wook and Jae-Suk come to the restaurant and they put him to work for the fundraiser. At the end the teachers come and they also give money towards Young-Eun’s sister surgery. Ye-Na and Ki-Soo go to the hospital to see Young-Eun and give her the money. Young-Eun is upset a t Ye-Na for flashing her money and making her feel bad and doesn’t want to accept the money. Ye-Na is crying and says she has never known she had a sister and wants to meet her. Ye-Na hugs her and says she is sorry she didn’t know she was having such a hard time and Young-Eun also starts crying. At home Woo-Hyun asks Mrs. Ahn what his father was like and she says he was a good man and they got divorced because they both wanted to lean on each other. Woo-Hyun says they should have leaned on each other and that she shouldn’t have regrets again and to work it out with Sung-Yeol’s dad. She gives him her necklace because the miracle of finding him happened and that he should give it to the girl he likes so he can stay with her forever. The next day Woo-Hyun, Seul-Bi, and Sung-Yeol go and have fun at a skating rink where they curl, skate, sled, and get a dog sled ride. They also write letters that will be sent a year from now. The three of them take a picture and in the picture Seul-Bi turns gray for a few seconds. At the restaurant Young-Eun comes in and Ki-Soo asks about her sister and she is doing well. Young-Eun wants to work there so she doesn’t feel indebted to anyone. Woo-Hyun goes home and Mrs. Ahn asks him a bunch of questions and he feels good that he has a mom to come home to that cares about him. He tells her Sung-Yeol is back to his old self and she tells him that she took care of Sung-Yeol but never gave him her heart and all she did was give Woo-Hyun her heart but did nothing for him. Seul-Bi and Sung-Yeol talk to his dad and tell him that they want to go out for supper today and he agrees. Sung-Yeol walks his dad out and tells him to be careful when running after fugitives and his dad is happy that he has his son back. Joo-Ah gets a call from her dad wanting money from her and Tae-Ho comes up behind her to surprise her and he can’t because of what she is talking about. The toy goes off and she finds him and she starts crying and he tells her to hit him and she does while crying. Woo-Young, Mrs. Ahn, Seul-Bi, Sung-Yeol and his dad are at the restaurant and they all agree for the divorce because the dad didn’t make an effort towards Mrs. Ahn. They give all these reasons sarcastically about them giving up so easily so they should just divorce and they all laugh. Woo-Young, Sung-Yeol and Seul-Bi go for a walk together and he teases Sung-Yeol that he is the older brother and he hugs him and they joke around. Later Woo-Young gives Seul-Bi his necklace that he didn’t know she had saved and he wears his mom necklace. At home Mrs. Ahn and Woo-Young talk and she asks if he think they can all live together and if she has a right after hurting him so bad. He tells her to help heal the wound and he wants to try having experiencing embracing a mother and tell her thank you for giving him birth and that he likes Sung-Yeol a lot. Sung-Yeol packs his bag and leaves his house. Seul-Bi talks to Sunbae and tell him that she wishes him happiness. Sunbae is outside and says as long as she isn’t back he can never be back, and he will prove that human love changes even if he loses everything. Seul-Bi goes to put clothes away and notices all of Sung-Yeol’s clothes are gone so she and Woo-Hyun go looking for Sung-Yeol. Sung-Yeol says to himself that he is leaving to live and to wait for him and that he will reflect on himself and learn a lot to come back a new man. He goes to cross a street and Sunbae is watching and takes control over a van and Woo-Hyun sees him and runs and pushes him out of the way. Seul-Bi comes over and holds onto Woo-Hyun, Sunbae comes and tries to stop the truck but is not able to. 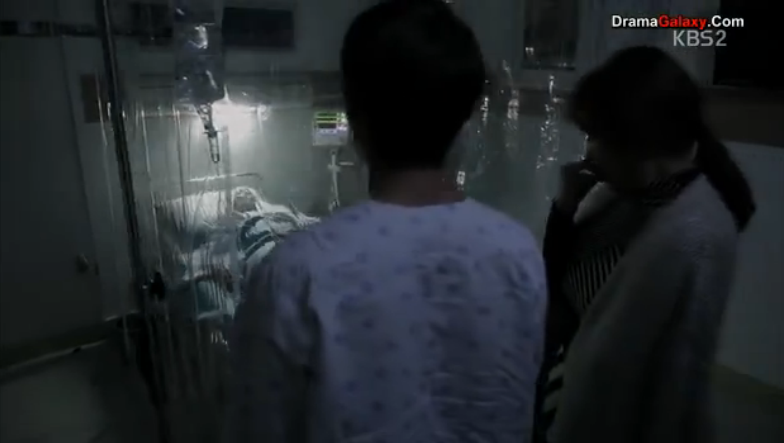 Woo-Hyun is in the hospital and Mrs. Ahn is next to him when he awakes and he asks about everyone else. She takes him to Sung-Yeol who looks in rough shape and is not awake. He asks about Seul-Bi and she tells him that she wasn’t there and he falls to the ground and she holds him and he cries and this ends episode 19.